Rain. That seems to have been the theme this week. 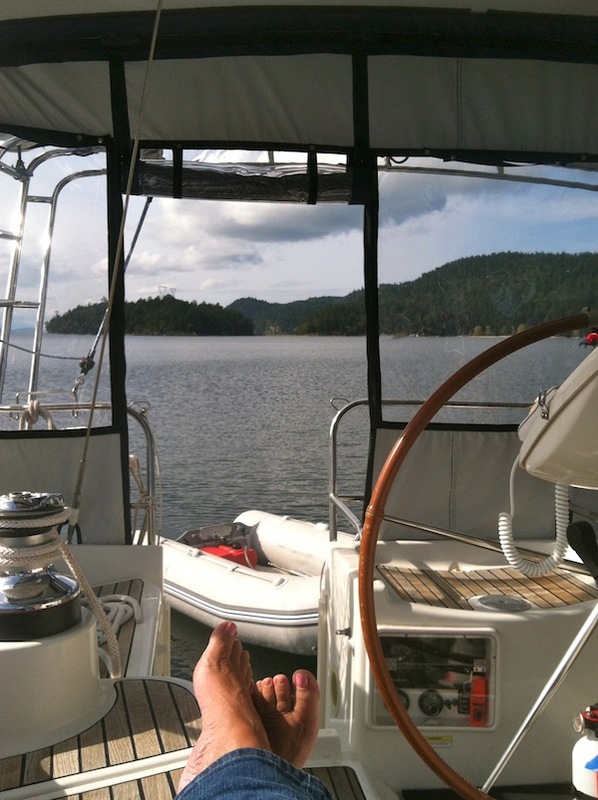 We did have some sunshine here and there, and now we’re heading off again in sunshine, so maybe spring is finding its way to the Gulf Islands. 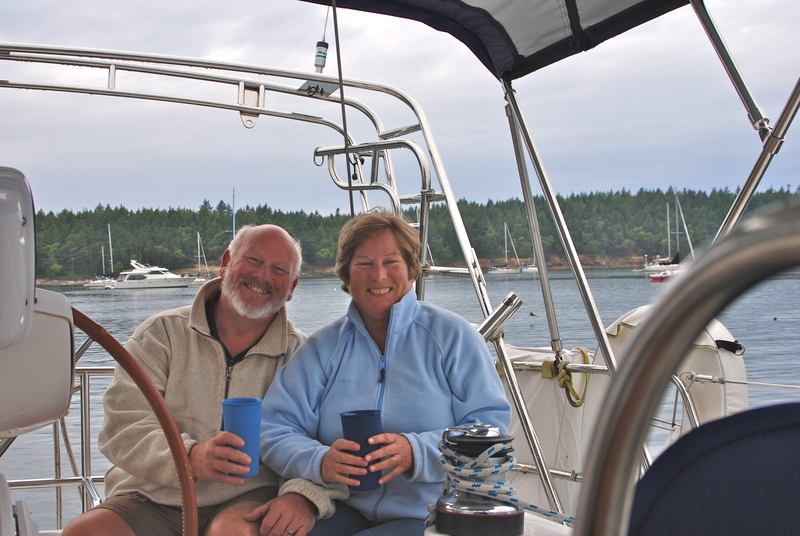 A rundown on our week…..
We left Prevost Harbor on Stuart Island last Monday, heading toward Canada. 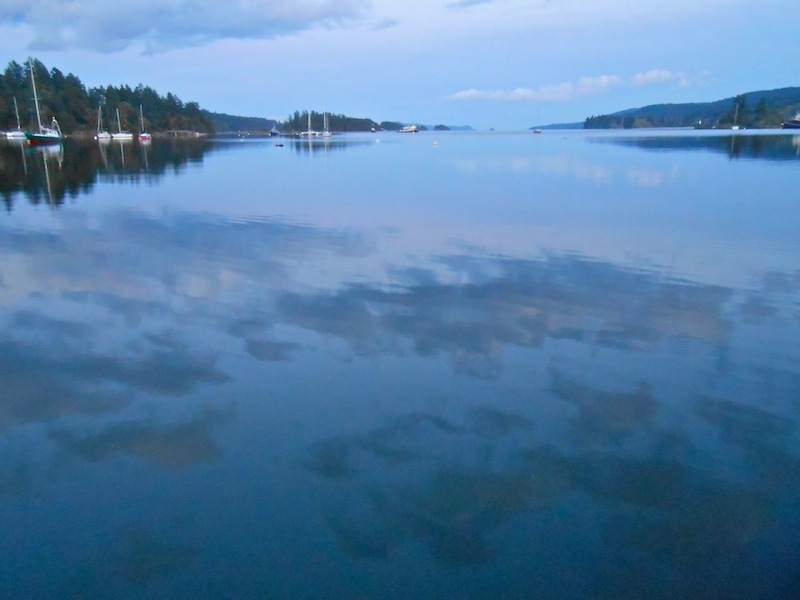 The crossing from Stuart over to S. Pender Island is only about 5 miles. 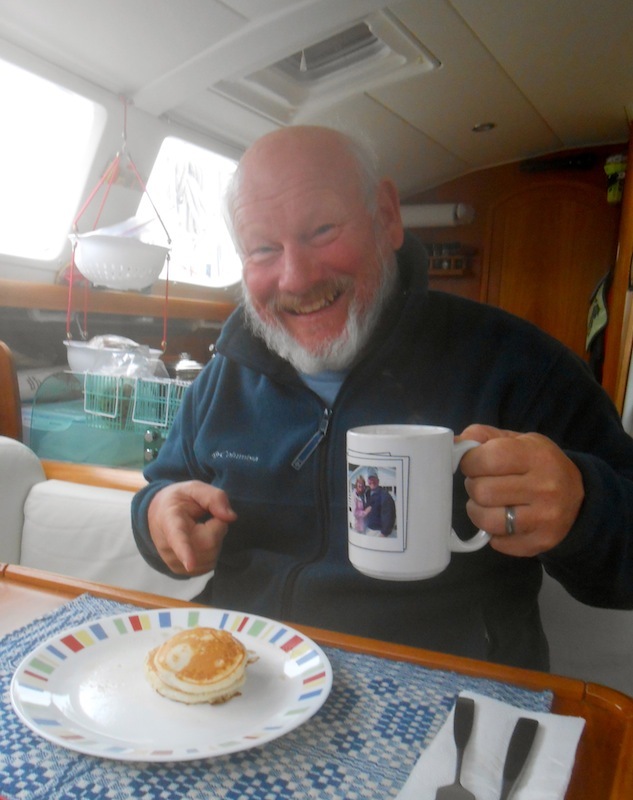 We motored toward Bedwell Harbour (we’re now in harbours, not harbors..! ), so that we could check into Canadian customs. Having recently gotten our NEXUS cards (a trusted traveler program), we were able to just phone in our information to the border patrol rather than having to dock in Bedwell and go up to the check in point there. It saved us a couple of hours to be able to pass Bedwell on our way to Montague Harbour. Nice! After getting our docs all in a row, we hoisted sails and headed down Swanson Channel at a nice easy 7 knots. The currents were in our favor, so even with little to no wind we were “making trees”. It’s always a bonus when we can turn off the engine and use those big white things to get somewhere! As we made the turn into Trincomali Channel we lost the wind and turned on the engine, which was okay since Marty was getting the watermaker going. We hadn’t used it since leaving Anacortes, so it had to be flushed to get the brine out of it. Pretty soon we were making water…the good kind..ha! We stayed in Montague Harbour for a couple of days while the weather changed from rain to patches of sun to rain again, enjoying the scenery and watching the eagles soaring over the cliffs. It’s a great spot, and it was different seeing it so empty; our past visits were in the summer when there were LOTS of boats. During our stay in Montague the generator decided to stop running. This shake down cruise is a great idea, but it doesn’t REALLY have to include everything having a problem does it??? So, after reading the manual and doing all the necessary checks, we decided to have it looked at when we arrived in Ganges the next day. We had been planning on going to Ganges for the weekend, so we just headed over a day or two early to make sure we’d be able to get someone to look at the generator. It turned out to be a cooling issue, in that the raw water wasn’t getting to the system. After replacing the impeller and the pipe leading from the through-hull to the raw-water strainer, all was once again running like a charm. We didn’t initially think we’d use the generator much, since we have the solar panels, but as I think I mentioned earlier…it’s been rather gray!! 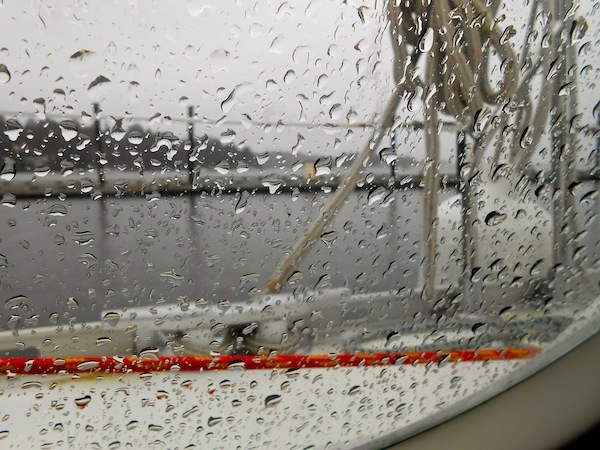 We spent another very wet day just hunkered down inside enjoying movies and books, watching the sea planes skim our mast as they landed, and staying warm. Even rainy days are actually kind of fun – but we don’t need them allllll the time! Yesterday was nicer, which was good timing since it was Saturday Market day in Ganges! They have this great market here, that is full of booths of arts and crafts, tasty foods, produce, and lots of fun. The interesting part is that everything in the market has to to be made, baked or grown on Salt Spring, so it’s truly a local market. Lots of fun, and lots of pretty things that won’t fit in a boat..ha! Today we are getting ready to head toward Pirates Cove for a few days. After our stop in the big city, we’re ready for a little quiet and hope that we’ll have Pirates Cove to ourselves. Oh, and it’s SUNNY today!! Yippeeeee! Next stop, Pirates Cove….ARRRRRGGGHH! 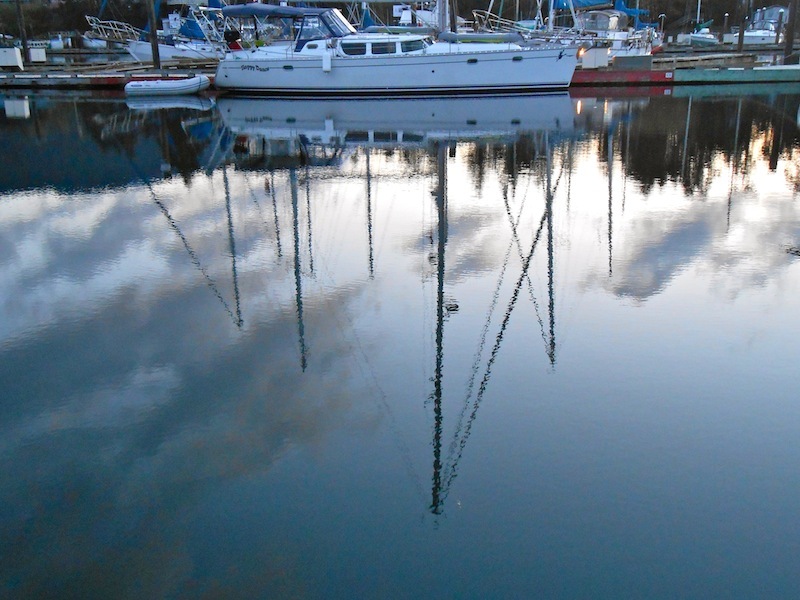 This entry was posted in Boat Projects, British Columbia, Gulf Islands. Bookmark the permalink. Thanks Scootie! Rain speckled and all it is a good life! you don’t get to retire until we are in another country… oh, wait… we are! Guess you can now if you really want to, eh! Love following your adventure. Maybe you can remember to let us know when you come San Diego way and we can rendezvous before your Baja Ha Ha adventure. Cell is 619-417-1306. Home is 619-473-9002. Arrrrrggghhhh!!! Watch your aft Maties!!! Looks like you two are having the time of your lives!!! Keep it up, you give us all hope!!! Ha ha!!! Even through the rain speckled windows it looks fantastic!! Thanks for bringing us along!!! Enjoy, but be safe! !